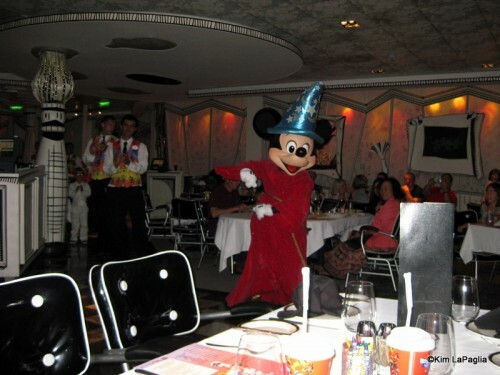 Disney Cruise Line: Backstage in the Kitchen! 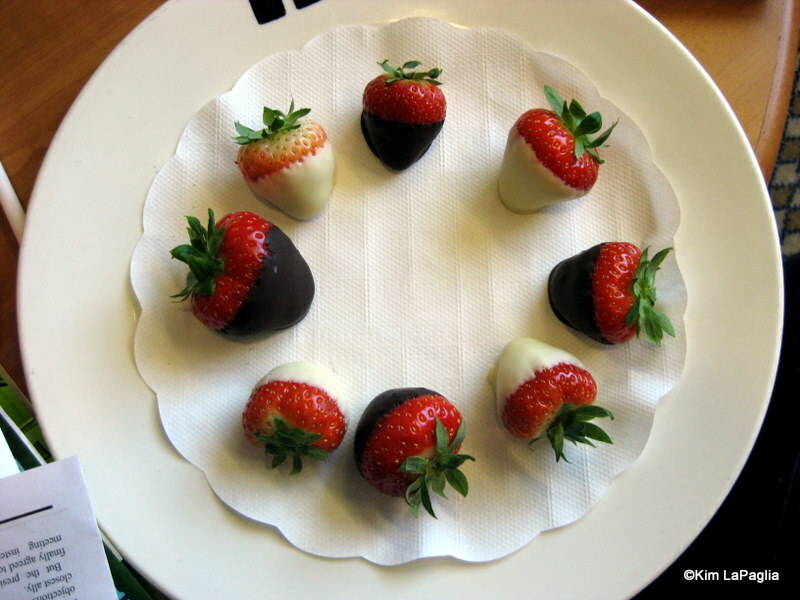 Disney Food Blog Editor Kim L. reports on some of the behind-the-scenes magic you may never see on the Disney Cruise Line! On one of my Disney voyages, I had the opportunity to tour the Kitchen Galley aboard the Disney Magic. During this behind-the-scenes sneak peek at culinary magic, I gained even more respect for the dining staff — they make it possible for passengers to dine (around the clock) on delicious cuisine. 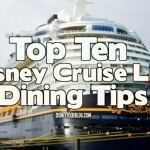 Let’s take a look at how food is prepared — in massive quantities — on the Disney Cruise Line’s Disney Magic Ship! How do things work in the Galley? 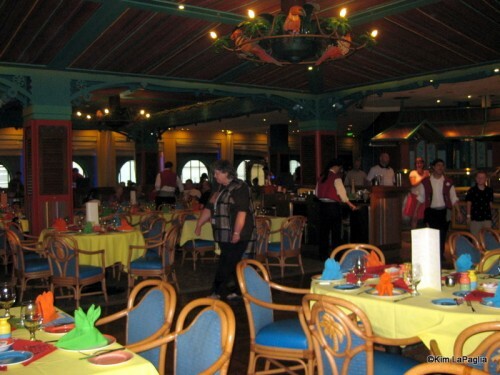 This particular galley anchored between Lumiere’s and Parrot Cay restaurants has a serving team of 225 people. 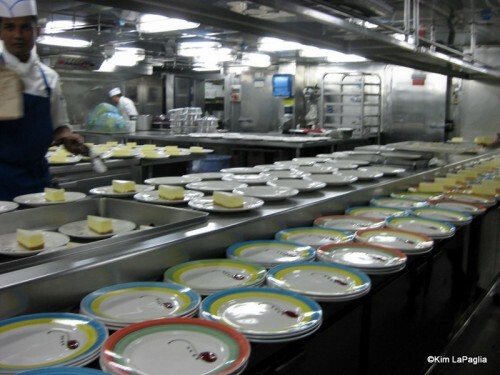 Among this large staff, there are 7 Chefs de Cuisine, 120 Cooks, 50 Galley Stewards (they keep the prep areas clean), and a 6 person team in the Dish Cleaning area. Plus, a Fish Prep Room is downstairs. Three section heads oversee each area including Veggie, Fish, Meat, and Sauce Prep Stations. While guests are on Castaway Cay, there is a 10:30 a.m. inspection by the Captain. And I feel overwhelmed in my own small kitchen. Yikes! Of course, the dessert prep is my favorite area! Did you know that each of the three main restaurants has their own children’s food prep line in the Galley? Why? Well, because Disney wants to make sure the kids get their meals first as well as catering to any picky eater requests. Brilliant! This may explain why my son always has his fave mashed potatoes added to every entree. By the third night, he doesn’t even have to ask! On the table next to us, the server had the kids drinks already waiting for them each evening! Kids' Drinks Already on Table! 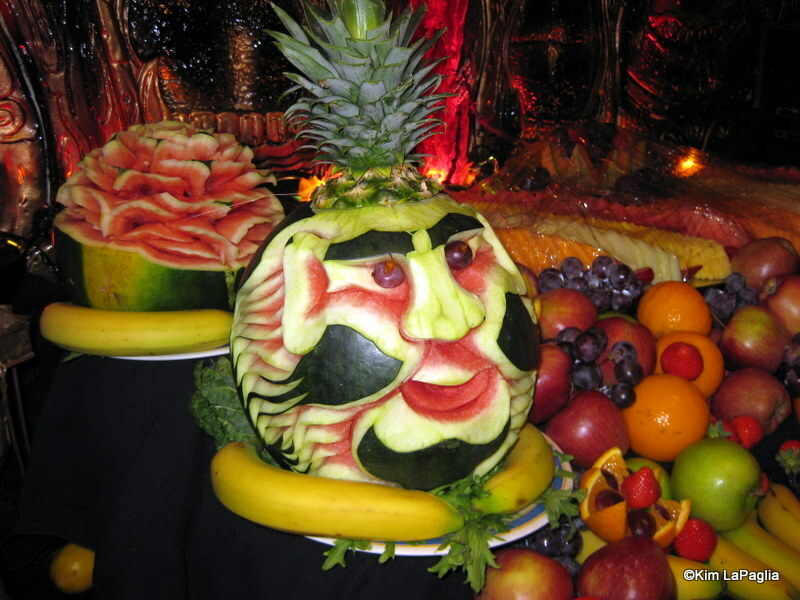 How much food do they use per cruise? Well, an example of the numbers is mind-boggling: 2,000 lbs. of tenderloin, 8,000 whole chickens, 6,000 watermelons, and over 10,000 meals per day are prepared! Everything is made “fresh to order” except basic prep, like what’s required for sauces and soups. 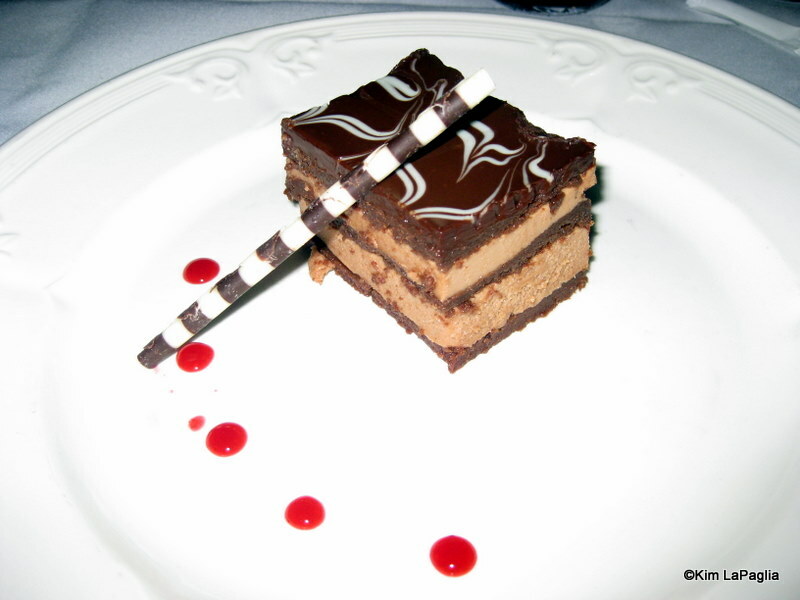 There is a Bakery on Deck 1 that runs a 24-hour operation for pastries and the other goodies that we all enjoy while taking a voyage on a Disney ship. How many people are served each evening? During dinner, there are at least 400 guests in each of the three main dining rooms: Lumiere’s, Parrot Cay, and Animator’s Palate. And the quick service locations provide snacks and meals too. Personally, I’m just going to blame it on the sea air. It just makes me hungry! What about special diets and allergies? For Special Diets including allergies, guests should fill out the Medical Form and Child Youth Activities Info Form prior to cruising. It is also important to speak with your server on your first evening regarding your special diet. The staff treats every allergy as if it was severe. Allergy Awareness classes are attended by Chefs and Servers. The Head Server and Chef de Cuisine are ultimately in charge of Special Diet requests and concerns. Are there food-related activities I can take part in? Yes! 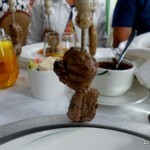 Check out the mojito seminar that Dining in Disneyland‘s Heather Sievers reported on last week. There are other cocktail seminars, and wine tastings as well. Cruising solo? Attend a singles lunch. For the kids, children can participate in Ratatouille Cooking School and teens can make their own pizzas. Of course, there are plenty of other activities as well — they vary by ship and cruise itinerary. Check out your personal navigator or ask at guest services for details. 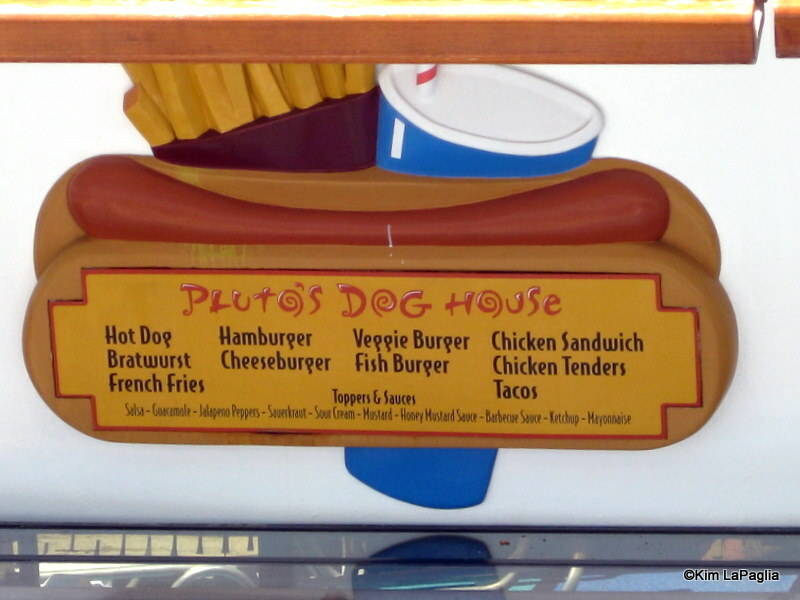 Pluto's for quick service dining! Do the lifeboats have food stocked inside? 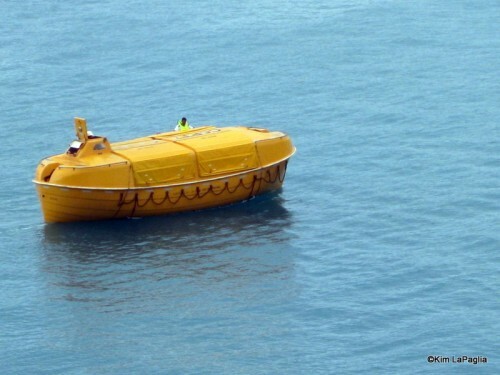 Yes, the lifeboats are stocked with rations! Food and water are on board each vessel, including shortbread biscuits. The food has a 10-year shelf life! 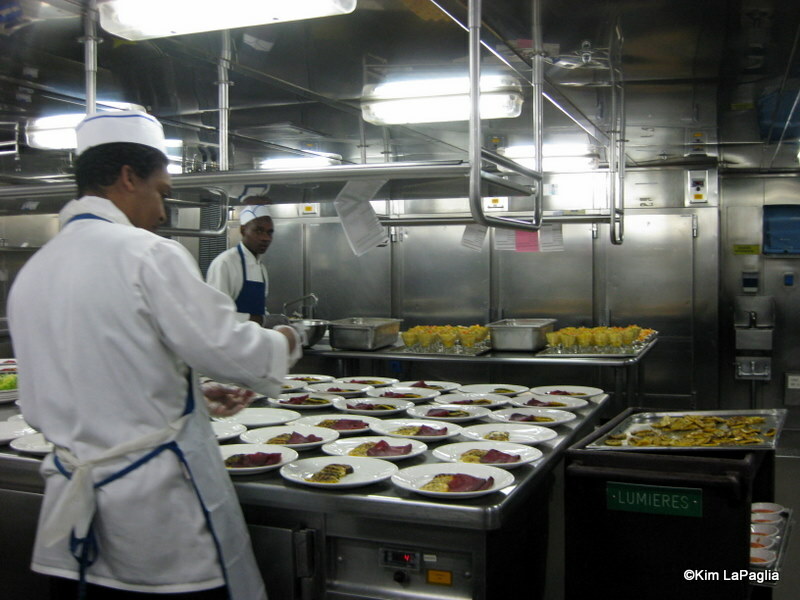 Next time you cruise, remember that the real work happens behind the scenes so that we can enjoy memorable meals. 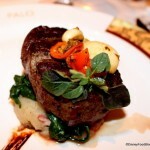 While dining in Animator’s Palate, you’ll be impressed with the food, atmosphere, and quality of service. 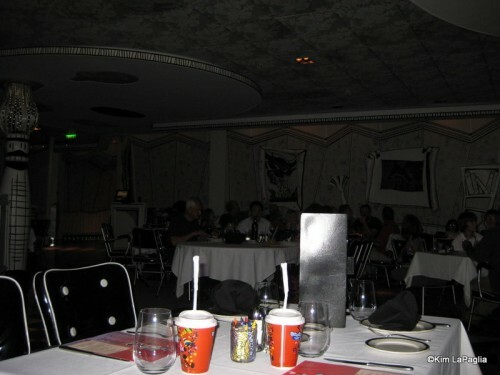 After all, Animator’s Palate cost $1 million to build! 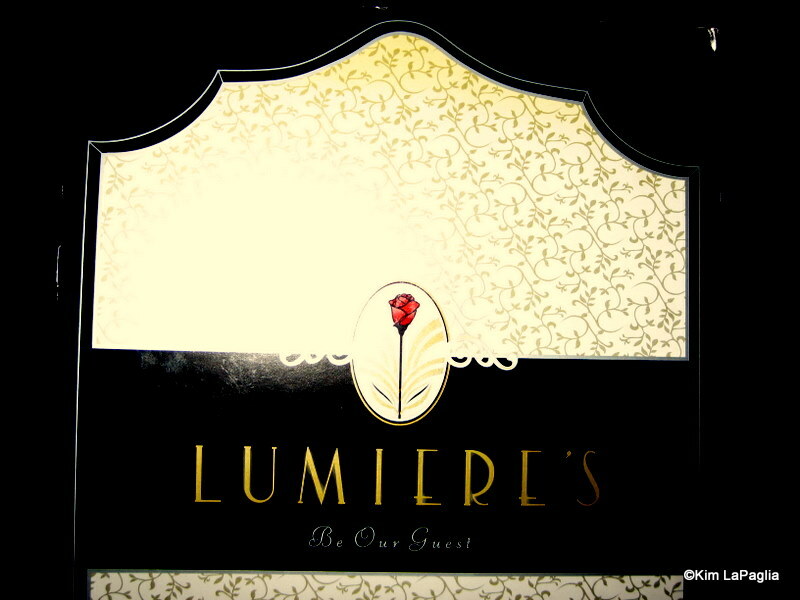 Lumiere’s, the fine dining restaurant, has a prime location. 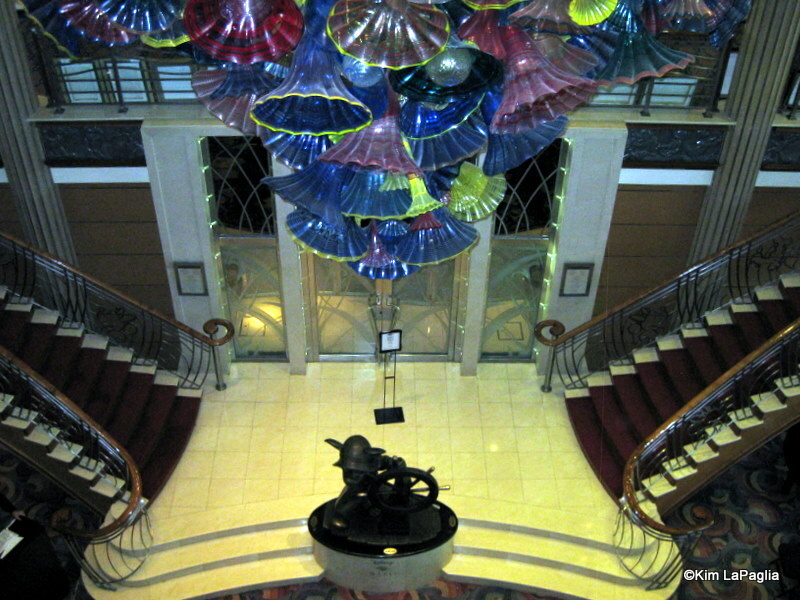 It’s interesting to note that in the early days of cruising, dancing would take place each evening in the atrium. 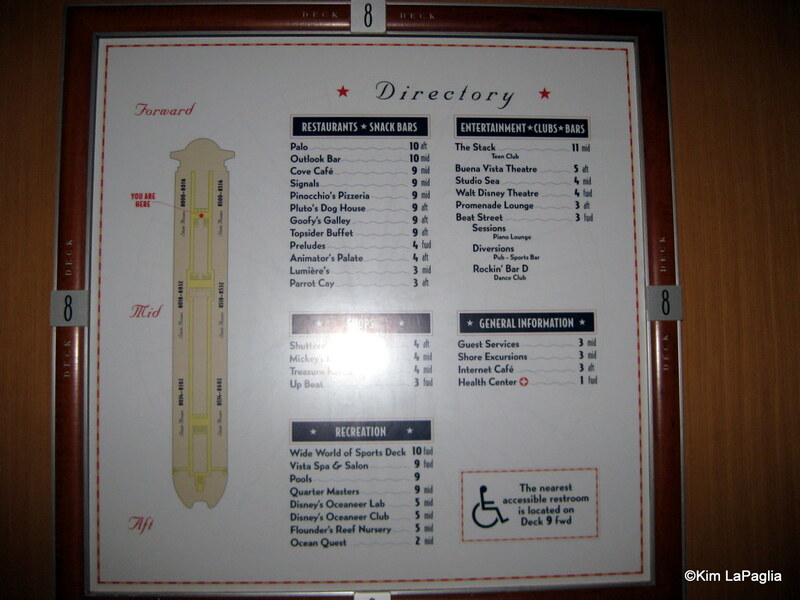 From there, passengers would enter the dining room. But always remember, as Lumiere says, Disney’s behind-the-scenes food magic is ultimately to make you feel that they’re asking you to “Be Our Guest”! 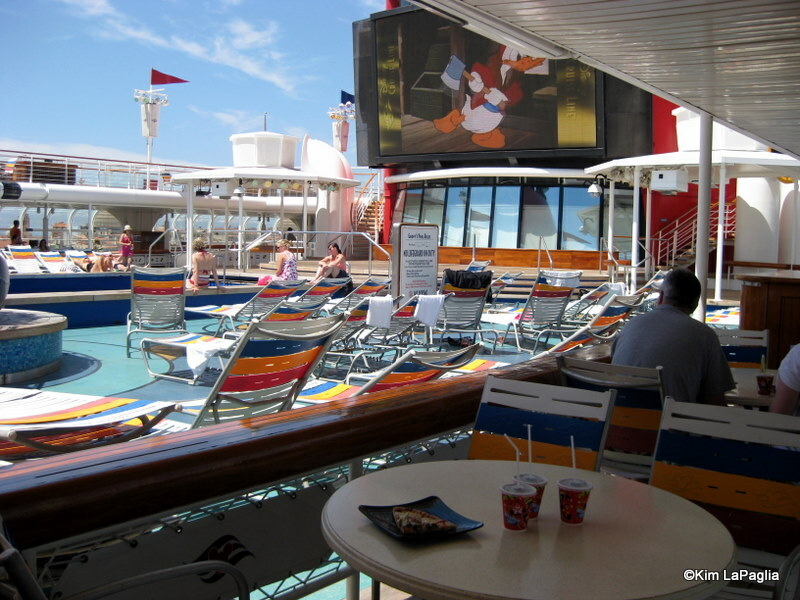 Do you have any fun facts and figures about cruising on the Disney Cruise Line? Let us know your experiences in the comments section below! Coming Soon! 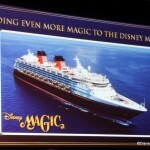 New Dining Options and Nightlife on the Disney Magic Cruise Ship! I’m so jealous of your Dream cruise. It’s still on my Disney wish list! 🙂 I’ve been aboard the Disney Wonder and Disney Magic many times though and can give you a hint about Galley tours. 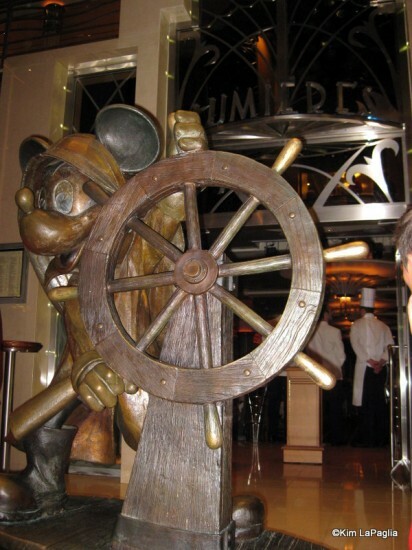 Go directly to Guest Services once aboard the ship and sign up for a Galley Tour. Space is limited! Tours are usually only given on at-sea days. 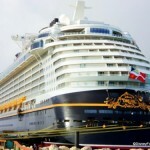 I hope your first cruise with Disney was a magical voyage! I haven’t been on a cruise yet. Hope to next year. I would love to tour the kitchen. JoAnn – keep me posted on your cruise plans!